I got a call from Karthikeyan from Erode to report an incident that happened yesterday….Karthikeyan is moving to a little bigger land for his cows etc. During the move process, he had some challenges in transporting the cows – particularly the breed that we rescued as they aren’t easy to tame…One of the cows couldn’t be tied…While trying to be transported, it got severely hurt on legs, they got fractured, got wounded in several places…It fell on the ground with foaming mouth…The team called the doctor immediately and it was declared that it is dying and just an hour away before death.. Doctor suggested to send the cow to meat place etc. However the team wanted to bury as per our tradition. Karthikeyan took viboothi to Periyava photo; prayed and applied on the cow and started pouring water to clean before burying…. The cow bounced back to life and sat up!!! Although its legs were fractured, it tried to stand-up but couldn’t. Doctor and the people around were completely surprised..It started eating, drinking water and now it is fully fine!! Karthikeyan couldn’t control his excitement – and so am I!! பெரியவாளின் திருவிளையாடல்களில் இதுவும் ஒன்று !! is possible. He is karuna moorthi. He cannot tolerate cow suffering. He showed once again why we should revere sacred cow. Hara Hara Sankara Jaya Jaya Sankara. OM JAYA JAYA JAYA SANKARA OM HARA HARA HARA SANKARA.OM JAI SRI SAI RAM, OM SRI SARVA MANGALA SATHYA DIVINE BLESS NOBLES. No words to express! Very fortunate cow. It got to live another life granted by none other than the god himself. and thanks for the Ravi Varma’s painting. Nice. Thanks for Gomaata-rakshanam. Here i wish to tell one thing please write as ‘Markandeyar and not Margandeyar’. For Margabandhu it is ok but for Markandeya, it is ‘ka’ and not ‘ga’. MahaPeriaval Thiruvadikal Saranam ! Saranam ! Saranam ! Only last week, I got 10 pockets of viboodhi from Erode”s cow sanctury. They perform viraja homam and prepare viboodhi.I got viboodhi to share with my like minded friends after briefing to them its sanctity. Really I am proud to know about this miracle. Jaya Jaya Sankara! Can you give me the Erode’s cow sanctuary’s contact number and address. I would like to know if I can get vibhoodhi shipped to my US address? Jaya Jaya Shankara Hara Hara Shankara. Karthi, this is Sai Saravanan. I am excited, ecstatic and moved by Periyavaa’s karunai for the Holy cow and his commitment to ghorakshana. I am thrilled to see you and others like Mahesh doing yeomen service following the footsteps of Sri Mahaperiyavaa. I am thrilled it have found you again and hope to keep in touch with you. Please email me whenever you can. 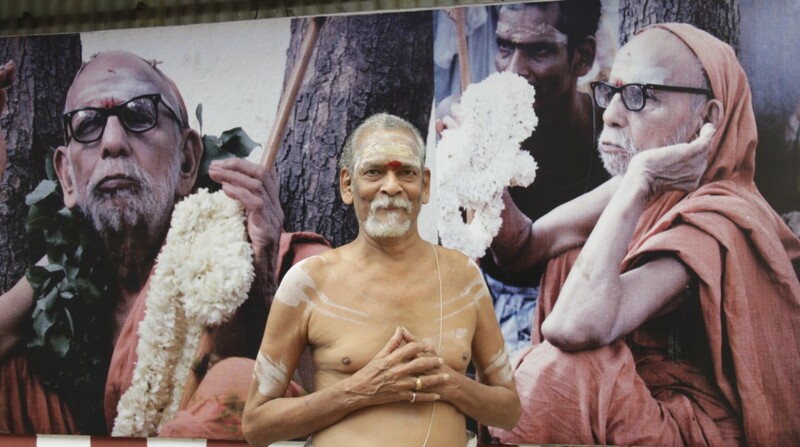 Jaya Jaya Shankara Hara Hara Shankara…Karthi, this is Sai Saravanan. I am so excited and thrilled, ecstatic to hear about Periyavaa’s karunyam on the cow. I am also thrilled to have found you back at a holy site such as this, and looking forward to get in touch with you. His ways of reinstating faith in human minds are unique..OM NAMASHIVAYA. Sri Maha Periyava Thiruvadigaley Saranam, Saranam! Wow!!! Adiayen Periyava Dasanu Dasan. Jaya Jaya Shankara Hara Hara Shankara! I was reading line by line and bit tensed but glad to see good climax only possible with the blessings of Maha Periyava who is sakshat Parameshwara. Just couple of days I read about Periyava asking about the same picture of Markandeya hugging Shiva in Thirupathi Gopuram! !